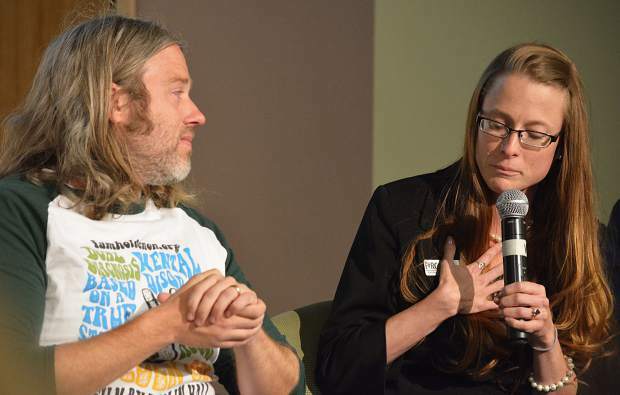 Betsy Casey, right, program manager of Summit County's Building Hope initiative, holds back tears during a discussion on suicide prevention with Tamlin Hall, director of the film on the subject, "Holden On," which played at the Breckenridge Film Festival this year. Casey lost her mother, longtime Summit County local Patti Casey, when she took her own life in January 2016. Editor’s note: The Summit Daily is counting down the top-ten stories of 2017. That’s a simple adage offered by officials in Summit County when they consider a vexing problem: Why, in a picturesque land of ski resorts, hiking trails and snow-capped peaks, are mental health indicators so bad — from substance abuse incidents to poor mental health days to, most grimly, suicide? In the past several years, this community has been forced to reckon with an acute mental health crisis, one that proves Summit’s attractions — drawing young and old from across the world with promises of high-alpine paradise — can’t always lift the burdens people arrive with. In fact, public health officials have said, the itinerant, seasonal nature of Summit’s population can make it even harder for people to find a stable, nurturing community here. Throw in high and rising cost of living, long winters and limited mental health resources, and it’s less surprising that the county draws low mental wellness marks in state surveys. But if this somber realization was a major story of 2016, punctuated by several high-profile suicides, the narrative in 2017 turned toward hope. A record-setting 13 people died of suicide in 2016, but the latest number for this year is only four. It’s cold comfort for those who lost family members, friends and co-workers. As health officials say, a single suicide is too many. But in the context of this year’s robust mental wellness campaigns — with community groups, local governments and law enforcement rallying behind the cause — it’s a promising, if not definitive sign that things are moving in the right direction. Coupled with promising developments at the state level, including funding for new a crisis center in Frisco, it could presage a major public health win in coming years. Building Hope Summit County, a coalition of local groups aiming to encourage more conversation about mental illness and lower barriers to care, has emerged as a major player this year, formed in response to the suicide death of well-known businesswoman and philanthropist Patti Casey in 2016. The group has provided at least 47 residents with scholarships to help pay for mental health care and plans on expanding that program next year, along with outreach efforts for the Spanish-speaking community and a continuing stigma-reduction campaign. Along with the High Country Colorado chapter of the National Alliance on Mental Illness, Building Hope has hosted dozens of events and workshops encouraging people to talk more about their problems and seek help when they need it. More than 700 residents have attended these events, and 90 percent said in exit surveys that they felt more connected to the community and more knowledgeable about where to go for mental health services, Building Hope said. While survey data show that the cost and low availability of care in the High Country are two of the principal barriers to care, health officials and advocates say a lack of openness about mental illness is part of the problem as well. If people are more willing to talk about the issue, that might reduce the alienation and fear that some feel in times of need. This year, many community members stepped forward to talk about their struggles with depression and addiction in Faces of Hope, a multi-part series of articles in this newspaper sponsored by Building Hope. Those stories reminded us that mental illness should never be a source of shame — in its overcoming, we can find strength. Carlos Santos, a Summit High graduate who struggled with addiction for years, shared his story in an article discussing local efforts to thwart opioid addiction (the article was not part of Faces of Hope). During his recovery from a spinal injury suffered during a football game, Santos became addicted to painkillers, an affliction that nearly derailed his life. He has since recovered, allowing him to help others through his work with the nonprofit Northwest Colorado Center for Independence. Summit County is the 11th-highest ranked county for opioid-overdose deaths in Colorado. This year, officials have collected hundreds of pounds of prescription drugs through an anonymous collection program, providing three drop-off boxes at the Summit County Sheriff’s Office, Dillon Town Hall and Prescription Alternatives Pharmacy in Frisco. This year, state grant money also allowed Summit County law enforcement agencies to join at least 133 others across Colorado whose officers carry Narcan, a nasal spray that reverses opioid overdoses. Paramedics already carry the drug, but since police sometimes arrive on the scene of medical emergencies first, equipping them with Narcan can save precious minutes — and lives. Equipping cops to prevent overdose deaths reflects one of the myriad ways they encounter mental health crises on the front lines. To that end, law enforcement has been stepping up its ability to respond to acute mental health problems and preventing people who should be patients from becoming prisoners. Along with several hundred residents, local law enforcement officers have been receiving crisis intervention training, a set of techniques for de-escalating mental health crises and averting suicide or other forms of self-harm. In September, local police and sheriff’s deputies successfully talked down an armed, suicidal man after six hours of negotiations, a peaceful outcome that officials credited to CIT techniques. The Summit County Jail has also been coordinating with St. Anthony Summit Medical Center to place more at-risk mental health patients in hospital beds rather than padded cells. Those efforts come ahead of a new law set to take effect on May 1 that will end the practice of holding crisis patients not suspected of a crime at the jail. Over the past two years, the number of people being placed on mental health holds at the Summit County Jail spiked by 1,365 percent, but public health officials hope the new law, Senate Bill 207, will bring that number down significantly. While keeping non-criminal patients out of jail is a goal everyone can agree on, it raises the question of whether or not the state’s non-jail crisis facilities will be able to handle the increased demand. Colorado is woefully short on psychiatric beds, but SB-207 set aside $7 million in marijuana tax revenues for mental health spending. Of that total, $2 million is reserved for rural areas, including a four-to-six bed crisis stabilization unit set to be built in Frisco’s Medical Office Building. The facility, which could open as soon as next spring, was a welcome addition to Summit’s limited mental health infrastructure. But a mere eight additional beds for the entire Western Slope is unlikely to blunt the mental health crisis felt in every corner of the state. In neighboring Eagle County, voters approved a marijuana tax that will raise $1.2 million for mental health and substance abuse programs in a landslide November vote. The ballot measure was hailed as an innovative way to fight mental illness, and advocacy groups hope its example will spread to other counties like Summit. A year is a short time for analyzing public health trends. But if 2016 was a story of mental health crisis, 2017 appears to have been one of progress and hope. While the underlying problems remain, groups from the state, local and community level have unquestionably made progress. Whether or not that momentum holds will be the story of 2018.